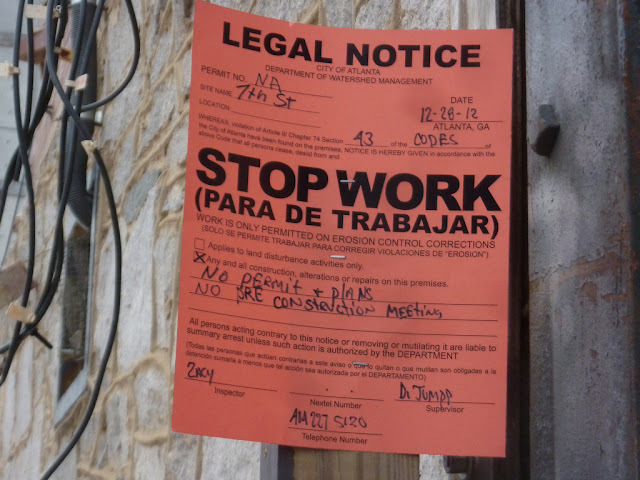 They took down the Stop Work Order. I'll bet demolition will continue on Wednesday, January 2. See "Permit? I Thought YOU Got the Permit" from December 29, 2102. There is no demolition permit for 109 Seventh Street, the address of the J. A. McCord Apartment. 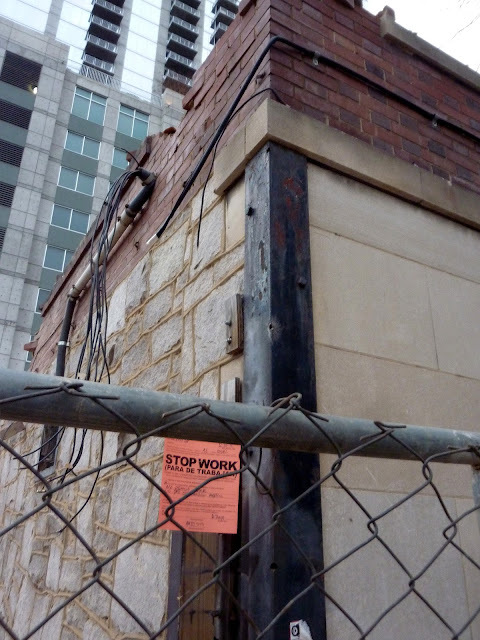 But there is a permit issued 2012-12-17 for 867 PEACHTREE, the address of the Starbucks next door that fronts Peachtree. Maybe the lots have been bundled already, if that's the term. J. A. McCord Apartment, first occupied 1923, designed by Neel Reid. Job 491, Hentz, Reid and Adler. - J. Neel Reid: Architect of Hentz, Reid and Adler and the Georgia School of Classicists by William R. Mitchell Jr.. This "stop work" sign went up after noon yesterday. At lunchtime workers were loading debris into roll-offs. At dinnertime I found this. I looked online and couldn't find the permit. Did you know you can search Atlanta building permits and enter complaints online? Stop work orders are common. In my neighborhood a contractor can go to court for leaving too many dirt clods on the street. They keep their eye peeled for little white pickups with a city logo. But I think the contractors on this demolition are too experienced to make this mistake. This demolition has been going on for 10 days. The sign was there from the beginning, December 18. I mean from the beginning of the end. See "On Peachtree You Can't Do It Like This Anymore." J. A. McCord Apartment 1923 designed by Neel Reid. Job 491 Hentz, Reid and Adler. - J. Neel Reid: Architect of Hentz, Reid and Adler and the Georgia School of Classicists by William R. Mitchell Jr..
Kirkwood has a fine collection of 100 year old houses. Atlanta's crisp, low winter light is doing it's magic on them. Kirkwood cruising is a great way for architecture tourists to enjoy winter. There are a few clusters of beauties but they are scattered around. Any street may have one. Kirkwood's housing mix isn't exactly unplanned but it's marvelously mixed relative to today. All of these are on one street. Somebody loves this one, records say 1900. 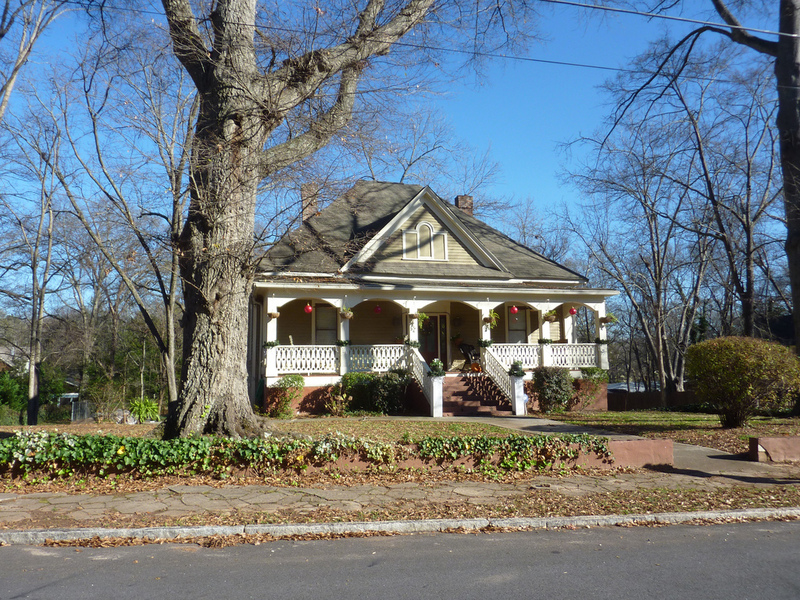 I'd call this the a Queen Anne cottage, modest with proud gables and porch. Records say 1900. It's in fine condition for being 112. Can yellow ever be wrong? This is 1910, a wraparound porch on a bungalow, how approachable, how elegant. Tax records say 1890. It's getting fix-up. You can still build them like this. 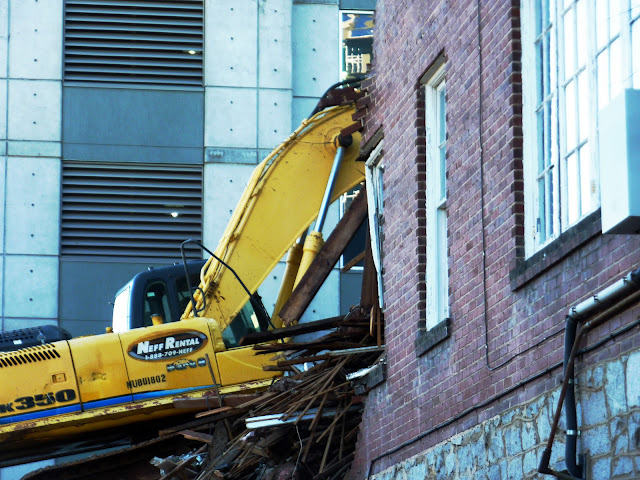 Demolition of 109 Seventh Street Atlanta, the J. A. McCord Apartment 1923 designed by Neel Reid of Hentz, Reid & Adler. It faces Seventh Street but it's just 50 yards from Peachtree. "Rumor that this was a Reid design proved correct. First Occupied in 1923." - J. Neel Reid: Architect of Hentz, Reid and Adler and the Georgia School of Classicists by William R. Mitchell. If you've lived in Atlanta long enough and frequent midtown, you might have caught this out of the corner of your eye. Which one doesn't belong? Each floor had two, 2 bedroom apartments. This shows the three east side apartments. On a circle of impressive estate houses it's the only one I can remember. It's the only one that makes me smile. It's so different from the neighbors, so close the street, and so classical that it's a public landmark as well as a house. It's on a bluff of Nancy Creek in a heavily wooded, hilly neighborhood with winding roads. The lot slopes steeply down a Nancy Creek bluff. The effect is startling. As you drive up, you meet the eave at eye-level. Isn't it funny? In this temple of a building the plain whitewashed chimnies stained with soot and the green capped roof lantern make me think of people living inside. In fall and winter it feels as if it's right on the curb. How old do you think it is? The big slope hides the neighbor's house from the street. I think it's a modern. You can just see the portico on the back. That's where the view is, toward the Nancy Creek valley. Here's a little classical lesson: "In Classical architecture, a giant order (also known as colossal order) is an order whose columns or pilasters span two (or more) stories"
So when was it built? 1999. It was designed by Christine Franck for Rodney Cook and I guarantee that Rodney had a big hand in the design. This is the way Christine and Rodney (and I) like them. P.S. Christine is an architect AND a powerhouse classical educator. Friend her on Facebook. Like Christine G. H. Franck, Inc. on Facebook. Follow @cghfranck on Twitter. The Christine G. H. Franck Flickr page is spectacular for classical fans. I've blogged her before at "Amazing Chadsworth Cottage and Chadsworth Columns." Learn more about Rodney at the National Monuments Foundation and the Millennium Gate. I've blogged Rodney here: "Leon and Robert Krier visit Georgia and speak in Atlanta" (except Leon couldn't make it). P.P.S. Rodney doesn't live here. I spiffed up the house before the ladies arrived for book club then bolted for ACAC, then Phoenix Metal Works, then Maigh's birthday tweet-up. Know Ashley Anderson? He's one of the many super-friendly bearded artists around here. I asked to see his sketchbook. 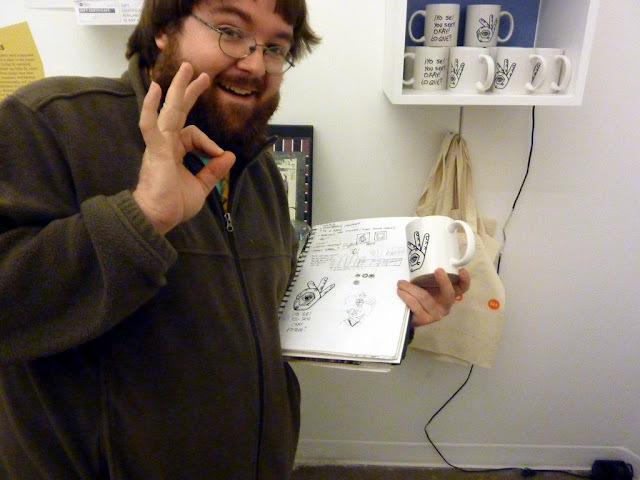 Turns out he'd designed the latest ACAC mug..
Is that cool or what? You can buy one from ACAC they'd sure appreciate it. Did you heard the good news about Young Blood Gallery and Mint Gallery? Short version: Young Blood was going to close after 10 years. Good News: The Young Blood store will remain open under new management, Mint will move to the gallery space, Young Blood founders Kelly Teasley and Maggie White will move on to other things including popup shows. Win, win, win. @ybgb and @mintatl. Before I left I got a little preview of ACAC's next event: featuring Alix Pearlstein. The Goat Farm is the site of Phoenix Metal Works, home of artist / metal worker Corrina Sephora Mensof. This is my favorite Corriana picture, in profile with crown. I'm the one with chins. You've probably seen her "Sun Moon Nautilus Passage" gate at the Atlanta Botanical Gardens. Above is a study for it. The word "awesome" was invented folks like Corrina. Corrina had a Christmas ornament DIY table. She's always working on commissions. Here is a rendering for one. This art has to fit and it has to work. She's built some of it already - stunning. Corrina has a thing for boats these days; sometimes boats with wings and wheels. This is how much they love Maigh, a real Twitter tag tag. They invented "awesome" for Maigh so we're keeping her identity secret. Merry Christmas, Happy New Year, Happy Holidays, Happy Birthday to Maigh. Last September I noticed sample colors on the Gilded Angel. Candler Park has two little "embedded" business centers, Clifton at McLendon is downtown. 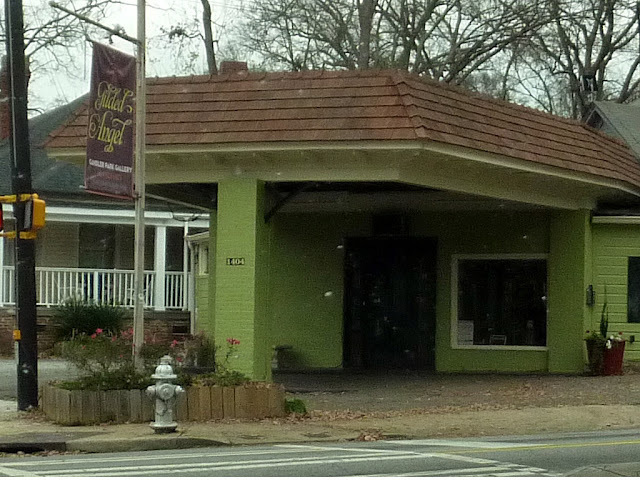 Oakdale at MeLendon is uptown and home to the Gilded Angel, now dressed in green. It's a fine little gas station. Property records say it was built in 1925. Note the single column holding up the roof. Reminds me of the single porch column at Robert A.M. Stern Architects' House at Seaside. 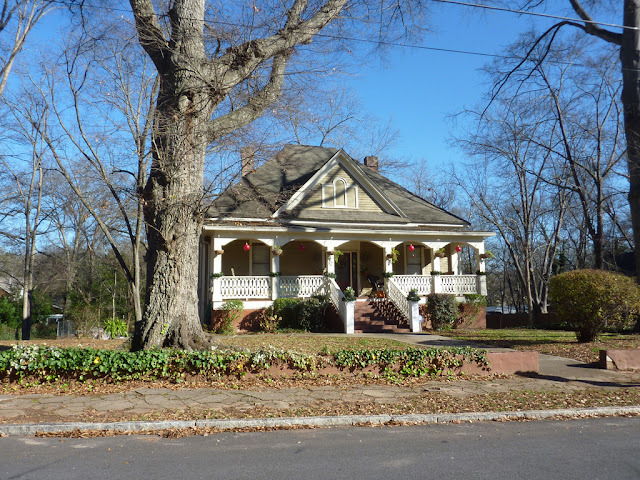 This ain't Seaside but Candler Park is just a picturesque: How about that porch next door? Here is the before and the sample colors. I love these neighborhood centers. 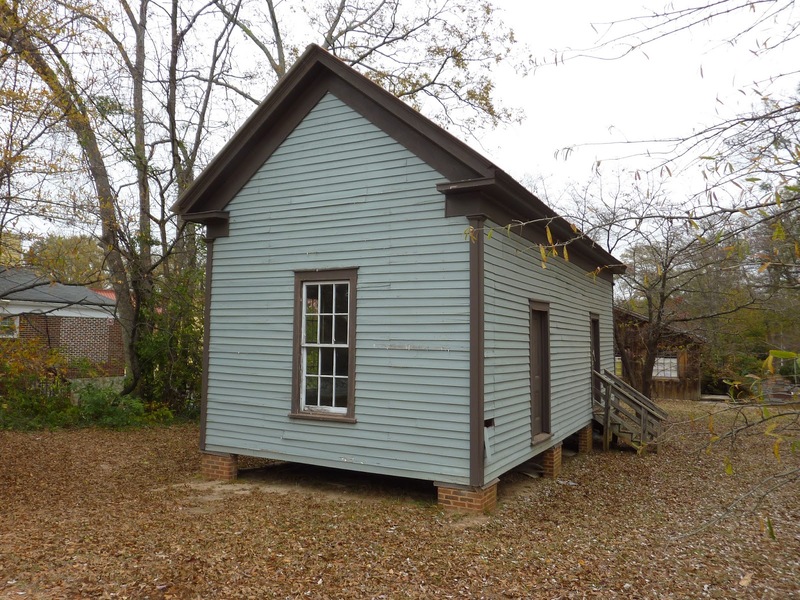 What is that double-pen saddlebag building in Decatur? In 2001 the Decatur (Georgia) Preservation Alliance moved this "two-room circa 1870s servant's quarters tenement structure." I think this means two mirror image rooms / apartments on either side of a central chimney. It's at the corner of Church and Bell, at the entrance to Decatur Cemetery. It's a bit out of place a few blocks north the the Dekalb County Courthouse. 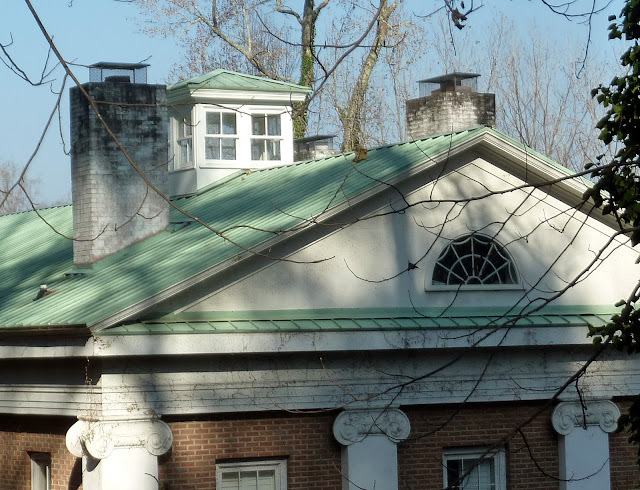 This particular shape is irresistible to me: gable end front and center, narrow and deep with a modest side porch. It risked wasting away a few blocks from the present site. I can't figure out exactly where it was. It's a familiar sight all over the south. It looks as if it's companion buildings have wasted away. We've mostly moved on from places like this. I enjoy more new constriction in this style. Georgia architects Historical Concepts does vernacular very well as seen here. It was time to stop and look. These are fine paneled doors with nice trim, original? The windows are trimmed out the same way. I doubt the sashes are 100 years old. Eave, soffit, return, and facia are pretty fancy. Contrasting frieze boards and coner-boards with a tiny cornice are a good look. It looks fine with dark trim but I'd prefer all white or less contrast. The detailing and dark paint make it quite a bit fancier and heavier looking that the Browning Courthouse, in Tucker above. When you get close it looks massive. What's inside a double-pen saddlebag? Looks like they took the chimney down before they moved the house. ...in 1893, the old church was donated to(sic) house the Donald Fraser School for Boys." If you've got a few minutes, why not stop and have a look for yourself. Leslie at the Dekalb History Center thinks they will move it a to nearby community garden. I hope they'll put it back in service. Thanks to Leslie for helping out on this post. It nice when you can save one.